Jump start with the crack on the backside of La Memel, often wet. Is this the boulder that starts with a jump to the lip and from there you mantel to top out? 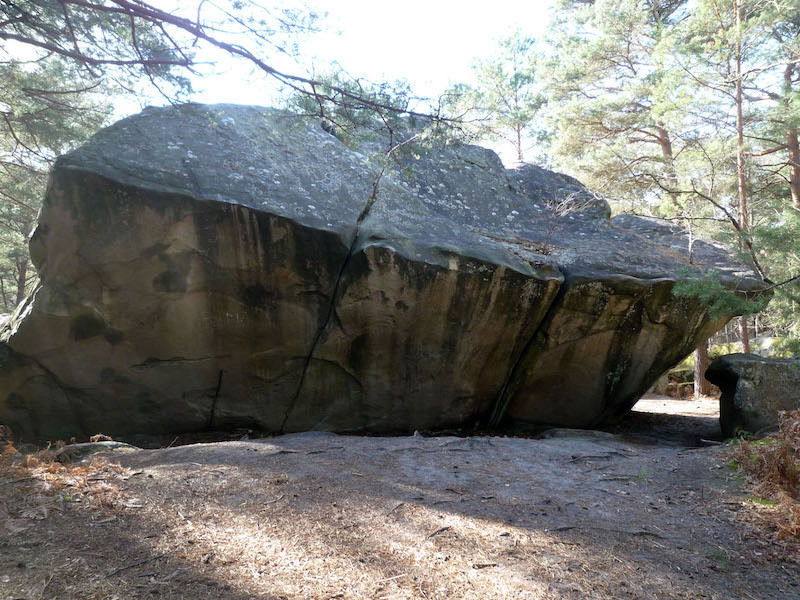 I've checked the guides now, and it seems that there are a few missing problems on the backside of the la Memel boulder. In 7 + 8 there are two problems: the La Ou Finit la Raie des Fesses 7b (7a jump start) and a nameless project left of it. In Montchausse & Godoffe there are also two problems: a nameless 6b to the left and a project just right of the 6b. They are probably talking about the same project though. I've done the obvious jump start to the lip and mantel centrally in the overhang, its hardly 7a, and I wonder if anyone knows what boulders/problems exists behind there?????? This one is the same line as la ou finit la raie des fesses of Manu Marques, which is in fact a low start of the old 7a problem by Pierre Gonzales. it's a crack in the middle of the overhang if i remember it well. to its left is an old abandoned project of Jacky Godoffe which is 8a+, but was never realised as Jacky thought it is too eliminant (the arete is partly not allowed). The other problems are the "trois retas" originally graded 4-,4 and 4 (source 1991 Isatis guidebook by Jean-Paul Lebaleur and Antoine Melchior). The 6b's you mention might be lower starts of them, I don't know. There's also an ungraded "jeu" which traverses leftwards along the lip and mantles.